Fletcher’s doesn’t have the best selection of the bookstores I visited, but it is by far the coolest to browse in. There’s nothing like a day spent browsing dusty tomes in hidden libraries. Getting a little antsy last week, I decided to drive up I-35 and visit some bookstores in Waco that I hadn’t been to in about two years. I also had a gift certificate for Cabela’s—about two years old—and there were some bookstores, as well as a barbecue place, in Salado, Belton, and Temple that I had bookmarked in Yelp but never visited. I would have gone Monday, but one of the bookstores isn’t open Mondays, so I went on Thursday. 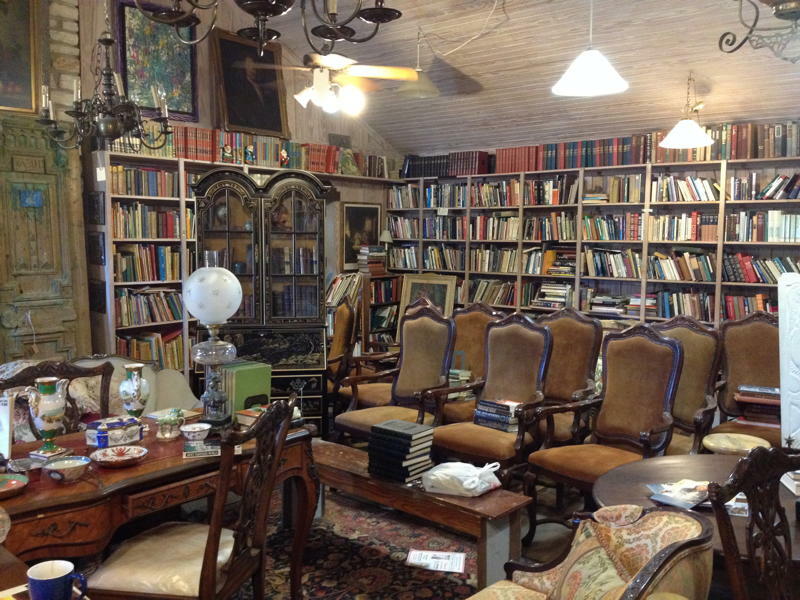 The first bookstore I went to, Fletcher’s in Salado, is also an antique store. While the books are a bit tattier the setting is the coolest of them all. The books are shelved amongst the antiques, so you’re looking around old grandfather clocks, busts, and lights. 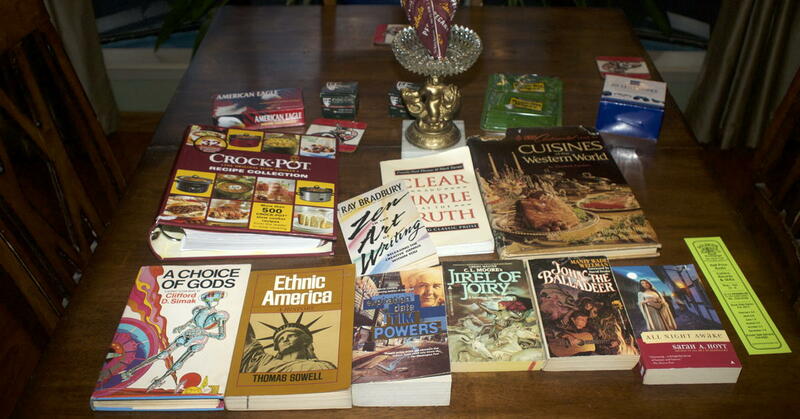 I picked up a Thomas Sowell book there. Next up, in Belton, I stopped at the McWha Book Store, where I found a book that’s been on my list possibly longer than any other book currently on it. In Temple, The Book Cellar is actually down stairs and into a basement, and it sells both books and comic books. Another out-of-print book on my list showed up there, this time a C.L. Moore paperback. I was pretty sure I’d find something nice at Golden’s Book Exchange and at Brazos Books in Waco, as I’d already been to them, and they both have a nice selection. Thanks to Brazos, it looks like I’m going to be reading Tim Powers’s fault lines series in reverse order, something that seems to be becoming a habit of mine. And it turned out Golden’s had a half-off sale starting on Thursday, unbeknownst to me, which meant that their half cover price was really a quarter of cover price. Yet another book on my list showed up there, making this an especially lucky trip, as well as a Sarah Hoyt sequel I didn’t even known existed. If this can be called work. I left a little before ten, since Fletcher’s opens at ten. I spent about an hour at each store, maybe a little less. On the way back, I broke up the journey by stopping at Johnny’s Steaks and Bar-Be-Que in Salado when I passed on the return trip. I ended up back home at about seven, a very full day of browsing dusty books! And a car smelling of books and barbecue by the time I was done. Since I was going north in the morning and south in the early evening, traffic wasn’t a problem except once in the evening around Temple, and that cleared up pretty quickly. There are at least seven nice bookstores between Austin/Round Rock and Waco near to I-35. I didn’t go, because I already go there regularly, but Georgetown’s public library has a nice bookstore, and Round Rock has a Half Price Books right off of I-35 near Louis Henna. The latter might be a good choice for ending the day if you’re traveling from Austin/Round Rock and then back again, since it’s open much later than the others. Most of these stores close around five or six. If you’re coming south, from Waco, of course, that makes it a perfect endpoint for your trip. If a book-browsing day sounds like something you’d enjoy, I recommend a road trip. An I-35 book drive last modified September 2nd, 2017.